TWENTY-FIFTH DAY. --GRATITUDE OF THE HOLY SOULS. The prayers and works of charity which we bestow on the suffering souls in Purgatory, not only increase our spiritual merit, they also call forth the gratitude of the holy, ransomed souls; for when these dear souls are, by our endeavors, admitted to the vision of God, they cease not to prove the warmth of their thankfulness and love by imploring for us the help of which we are so much in need in the manifold dangers and great troubles of life. How can the faithful departed, who are loved by God so tenderly, and predestined to glory, fail to be able to pray, not, indeed, for themselves, because they are not in a condition to merit, yet pray with efficacy for their benefactors still alive? Not only will they speedily pay their debt of gratitude to those who befriend them, but, our dear Lord Himself, Whose greater honor and glory will be promoted by our devotion to the holy souls, will readily assist them to requite the services rendered them by the faithful upon earth. St. Alphonsus Liguori, says, "He who assists these distressed souls, so tenderly loved by God, may confidently hope for his salvation, for, when such a soul obtains deliverance through his prayers and good works, it incessantly prays for his salvation, and God will deny nothing to such a soul." Prayer: We beseech Thee, O Lord! vouchsafe to hear the suffering souls, who supplicate Thee for their benefactors, that we, in union with these holy souls, for whom we offer fervent prayers upon earth, may praise Thy mercies forever. Through Christ, our Lord. Amen. 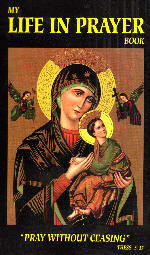 Special Intercession: Pray for the souls who suffer for their faults against charity. Practice: Bestow charity upon others without expecting gratitude.